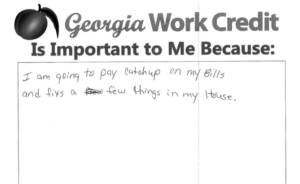 When asked how tax filers at Georgia VITA sites planned to use the EITC or had used the credit in years past, four out of five respondents talked about using the credit for basic necessities, such as paying for food and household bills. And almost half of respondents discussed making investments in future economic mobility, such as getting an apartment or buying a car. These survey results from the Center for Working Families Inc. match up with academic studies that point to families using the credit for two primary goals – paying for basic needs now and making investment in the future. Read some the respondents’ answers in their own words.